The following is the seventh installment of the tale which began with Takeoff, and continued with Shopping Trip Parts I. through IV and The Test Flight. All prior installments should be read before this page, as that may help to render the following events marginally less obscure. Well, Taurina, we're one day on our way, and it's looking like it's going to be a long 12 days. Last night, after we finally got under way, we humans were all pretty tired, and I just collapsed into bed. I didn't plan to get up until lunch time, at the earliest -- 12 days with nothing to do but relax seemed like a great idea! It still seems like a great idea, but so far it's not happening. It seemed like it was still the middle of the night when something dragged me up from the depths of a dream. Something seemed to be brushing my eyelids. What's more, there seemed to be some sort of weight on my chest, pinning me down, and making it hard to breath. "Horrors!" I thought. "I'm caught in one of those awful night terror dreams!" 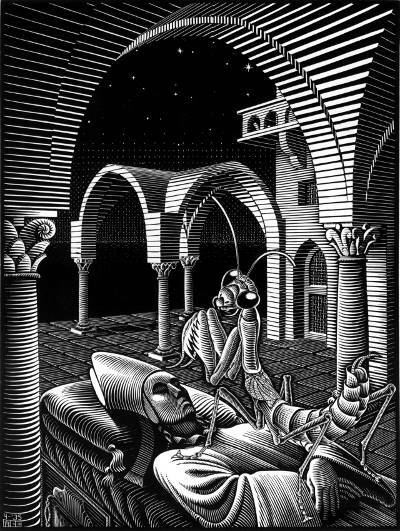 I'd read about "night terrors" in a book about Escher, and I still remembered his picture of a sleeping person with some weird giant bug-like creature standing on them. With a sudden feeling of total terror, I wondered what I'd see if I opened my eyes -- and I wondered if I even could open my eyes. But that last scary thought woke me up a bit, and as a few more brain cells started working, I realized that in a ship full of cats, there was a far more mundane explanation: Somebody was standing on my chest and breathing on my eyelids. I opened my eyes, which didn't help at all -- it was too dark to see anything. Too dark for me, anyway; apparently the light leaking around the curtain in the doorway was sufficient for someone to see me. "I see you're finally awake" came a meowy voice just inches from my ears. It was Snidly. "Uh ... what's?" I asked, incoherently. "Are you up?" asked Snidly. Rather silly of him, I thought, as he was still standing on me: he knew perfectly well I wasn't "up"! I finally got myself together enough to ask, "What's happened? Is there an emergency?" Snidly jumped off the pile of cushions which serve as my bed as he said, "Ituafe! ", and then added, "Come!" and vanished into the gloom. I jumped out of the "bed", took two steps toward the door, tripped over something, and fell flat on the floor. "Ouch!" I said, and, "Snidly, where are you? ", and then, more usefully, I said, "Lights!" and the lights came on. I looked around -- no Snidly. The thing I'd tripped over was glaring at me. It was Dense. "Emergency?" he asked. Actually, he'd just said, "Ituafe" -- "Obviously" -- when I asked if there was an emergency, which wasn't quite the same thing, but he certainly seemed perturbed about something. "Come!" Snidly suddenly called, from outside the curtain that was strung across my doorway. "Let me get some clothes on!" I called. "Come now! Current fur just fine!" So, OK, I guessed it was pretty urgent. So, still in my pajamas (the ones with mice all over them), I headed out through the curtains after Snidly. As usual, the lights in the hall were lit. "Night" and "day" only really exist for the humans on the ship; the cats sleep when they feel like it, on no particular schedule. And they seem to be just as content to sleep in a brightly lit room as they are to hang out, wide awake, in a dark one. I looked around for Snidly. He was some distance away to my left, glaring at me. "Come!" he said, again, and trotted off down the hall. As I followed him, I realized with a start that he wasn't heading for the bridge. Where could he be going -- a meeting somewhere? I wished I knew what time it was; my watch was back in my room. Wherever we were going, he seemed to be in a hurry to get there. I had to jog to keep him in sight. When Snidly finally vanished through a doorway off the corridor, it wasn't any of the usual meeting halls -- it was Aunt Eternuechat's room! As I hurried to catch up and join him, I heard an odd sort of ripping or buzzing noise coming from the room. "Rip! .... Rip!.... " As I followed him through the doorway, I saw that there was a sort of meeting taking place -- but the only participants were Auntie and Dad. They were sitting on folding chairs, at a small table -- a folding card table, I realized. "At last! Here's our fourth!" Auntie cried, as I approached the table. And there was that ripping noise again -- it was Auntie, riffle-shuffling a pack of cards. "Fourth?" I asked, in some confusion. "Fourth what?" Auntie laughed. "Fourth for bridge, of course!" I looked around. Mom was nowhere to be seen. There were just the three of us. "Fourth?" I asked again. "Who's third? Are we waiting for Mom?" Dad rolled his eyes. "Felicia begged off. I think she prefers a slower game." He gave Auntie a kind of odd look. "Oh, nonsense, Felix! Felicia was just needed on the bridge this morning. I'm sure she'd have loved to join us if she hadn't absolutely had to be somewhere else!" Dad rolled his eyes again and muttered something that sounded to me like "Anywhere else!" Auntie fanned the cards face down on the table. "Cut for partners!" she said with a grin. I'd already noticed there was something unusual about them. The backs were black and orange, rather than the traditional blue or red. As I reached for a card, I realized the back design was a border of orange filigree, with a black Vitechat double headed eagle in the middle -- or, rather, there were two of them, rightside up and upside down, like the riders on the back of a bicycle deck. A quadra-headed eagle, I suppose you could call it. "But Auntie", I said, again. "Who's the fourth?" "You are, dear!" She laughed. "Then who's third?" I looked around the room again. There were just the three of us. I looked under the table, and Snidly looked back at me. "Snidly, of course!" said Auntie with another laugh. "Ituafe!" said Snidly, who had jumped up onto one of the empty chairs. "Ituafe I don't think so!" replied Auntie, looking at Snidly. Then she said to me, "Snidly's just learning -- and you're going to help me give him his first real lesson, with a real game!" I stared at Auntie. "This was the emergency Snidly got me up for? You needed a fourth?" "Yes, dear. It's always an emergency when we don't have a fourth, of course." I couldn't really see it that way. Taurina, as you know, I'm not much of a bridge player. Dad's taught me some stuff, but the only times I've really played were those times you came over for dinner and stayed for a game. "What time is it?" I asked, yawning. "Time for a refill" said Dad, looking into his coffee mug. He didn't seem to be wearing a watch. "Oh, what difference does the time make? It's time for a bridge game!" said Auntie. "Isis, you still haven't looked at your card!" "What difference it makes is that I haven't eaten anything, I'm still in pajamas, and I need at least 3 more hours of sleep," I yawned. "But, OK, I'll play one hand but then I'm taking a break." I picked up the card I'd drawn, and suddenly wondered if I was really still asleep in bed and dreaming. "Auntie, what is this thing?" I asked, showing it to her. "It's a card, dear, as I expect you know." "But what card?" I said, frustrated. "It looks weird!" "Weird? What's weird about it?" Auntie asked, peering closely at it. I noticed Dad was snickering. "It looks fine to me -- I don't see anything wrong. It's just a perfectly ordinary Three of Mice." "There's no such thing as a Three of Mice!" "Certainly there is -- and there's the proof, you've got one right there in your hand. See, it's got a three in the corner, and see, that's obviously a little mouse face, and look there," Auntie ran her finger down the middle of the card, "there are three mice in a row. Yup, Isis, it's a Three of Mice alright." Snidly, who had been watching in apparent fascination, reached a paw over and drew a card. He hooked it out of the fan of cards with one claw, and then, using both front feet, flipped it over. It was obviously an ace -- but not one I'd ever seen before. "Ah, Snidly, you've got the Ace of Cats!" Auntie exclaimed, in a delighted tone. "And I've got the Six of Rabbits!" she said, turning over her own card. The rabbits on her card were orange, while the mice and cats on my card and Snidly's were black. "What've you got, Felix?" Auntie asked. "Unless it's a deuce, it looks like we're partners." Dad, now laughing aloud, flipped over his card. He had the (orange) Five of Dogs. "Auntie, where did you ever get these cards?" I asked. "I've never seen anything like them." She laughed again. "They were a gift from Herbert, back when I opened my practice. He had them custom designed. In fact the minimum order for custom cards is ten cases, so I've got rather a lot of the things. Of course," she added after a pause, "he paid for them with my money." As it happened, I was already across from Snidly, and Auntie and Dad were across from each other, so we didn't need to change seats. "Shall I deal?" Auntie asked, somewhat rhetorically, as she swept up the cards. "Sounds good," said Dad. "I'll go get that refill in the mean time." As Dad walked across the room behind me and out the door, Auntie zipped the cards through a riffle shuffle and several lightning fast overhand shuffles. "Cut?" she asked, plopping the deck in front of me. "Uh ... OK." The cards felt almost hot as I cut them -- they were getting a workout! Auntie swept up both piles with one hand, completing my cut, and then dealt, faster than anyone I've ever seen, except maybe a croupier in a James Bond flick. (Or does a croupier just handle the dice? I've never been sure.) Anyhow, Dad had barely made it out the door when the deal was done. "Dad!" I called. "We're waiting for you!" I heard his feet break into a run in the hall, and fade into the distance. "It's OK -- it's Snidly's bid, anyway," said Auntie. Indeed, there didn't seem to be much of a rush. Snidly hadn't finished arranging his hand. Actually he hadn't finished picking up his cards. In fact, he'd barely started picking up his cards, and, in fact, he was making rather heavy going of it. He'd started by scraping them over to the edge of the table with his claws, and then he'd managed to get one card in his right front paw, gripped with his dew claw, which is sort of like a thumb. Then he set about picking up a second card, with his left front paw; after a lot of scraping, which left a line of scratches across the back of the card, he finally got it, between his fifth and sixth toes. At that point he paused, and glared at the 11 cards still on the table in front of him. Next was the transfer of the second card to his right paw; after a short struggle he managed it, and set about picking up a third card. After a lot of scratching, which didn't accomplish much beyond putting lines of gouges across the back of the card, I heard the low sing-song sound of a cat's growl start up. Suddenly there was a silvery flash, and Snidly impaled the card with one of the long knife points which he can pop onto his claws. With a triumphant look Snidly thrust the third card into his right paw -- and dropped the first two cards. One landed face up on the table; the other went onto the floor. Snidly hissed at the cards still left on the table, then suddenly scraped them together into a small pile and stabbed his silvery metal claw through the stack -- and, it appeared, through the thin surface of the card table. As he tried to lift up the stack, nothing happened: His claw was stuck in the table. Snidly said something in Iemy which I didn't understand, and started wiggling his paw this way and that in an effort to free the stuck claw. After few wiggles, it came loose, and he lifted it up along with the cards -- or, anyway, about half of them. The rest slipped off the end of the claw, some joining his earlier lost card on the floor. Most of them plopped back onto the table, with the Ace of Mice landing face up on top of the heap. Snidly hissed again, shook the rest of the cards off his claw, seized the Ace of Mice in his claws, and ripped it to shreds. Jumping off his chair, he stalked off across the room toward the door, his tail as puffed up as I've ever seen it. "Wait, Snidly!" called Auntie. "Let me get you a card rack -- it'll help a lot!" Before he could answer, I heard pounding feet in the hall, and Dad charged through to door, saying, "I hope I didn't keep you waiting!" "Look out for Snidly!" I yelled. "Oops!" said Dad, as he ran headlong into Snidly. "Gurgle!" added his huge coffee mug, as it went spinning off through the air toward the card table. As Dad went down full length on the floor and Snidly scrambled to avoid getting pancaked, Auntie dove across the table, almost landing in my lap, and caught Dad's coffee mug before it could splash down on our game. She looked amazed -- which is how I certainly felt: No coffee had spilled. "Felix -- you got a lid for this thing!" "Actually had it a long time -- found it again today when I was looking for clean socks," Dad explained as he got up from the floor. "Thought it might be useful -- and it was." "Will wonders never cease," Auntie observed, as she set the mug on the table and went to a back corner of the room, where she rummaged in a large sack. "Here, Snidly, this should help a lot!" she called, as she came back to the table carrying what looked like an overgrown Scrabble rack, along with a roll of duct tape. I looked back at Snidly. He was washing his face, but he stopped, looked at Auntie, and then sauntered back to the table -- reluctantly, I thought. By the time Snidly was back in his chair, Auntie had arranged twelve of his cards on the rack, and was in the process of sticking the shreds of his last card -- the Ace of Mice -- back together with a piece of duct tape. "There you go, Snidly!" she said, putting the last card on Snidly's rack, and sitting back down. "And it's your bid!" Snidly looked at his cards, and after a short pause, announced, "Thirteen mice!" "You can't bid thirteen mice, dear. Remember, the highest you can bid is seven." "I have thirteen mice; why can't I bid them?" I gasped. If what Snidly said was right, he'd been dealt all thirteen cards in the mouse suit. The odds against that were ... um, high. I looked at Dad. He wasn't saying anything. He was just sighing and looking at the ceiling. He hadn't picked up his cards yet. "Remember what I told you, dear," Auntie was saying to Snidly. "You're bidding to take six more tricks than your bid. So if you bid seven, you're really bidding to take thirteen tricks. So, you can bid all thirteen mice but you do it by saying 'Seven mice'." "Silly rule." said Snidly. And then, "Seven mice." I'd looked at my hand while Snidly was working out his bid. It was every bit as weird as Snidly's -- I seemed to have every face card, and every ace, except for the Ace of Mice which, of course, Snidly had. "Well, partner," Auntie said, cheerily, looking across the table at Dad. "What do you say over Snidly's seven mice?" "I say misdeal," said Dad. He tossed his hand on the table, face up. He had the six of dogs, along with all the 2's, 3's, 4's, and 5's of dogs, cats, and rabbits. "That's so weird!" I said, with a gasp. "Right," he said, with a laugh. "Very unusual! Isis, did you cut the cards?" "But did you complete your cut?" he asked, looking at me intently. I thought for a moment. "I cut the deck in two, toward Auntie, but Auntie put the piles back together, I think." Dad snorted. "Here's something to remember. When Aunt Eternuechat is dealing, and you cut the cards, always complete your own cut!" "And now," he said, turning to Auntie, "Could we please have another deal?" "Really, Felix, I was just having a little fun with the first hand. But if you insist, we can throw it in; next deal is Snidly's." Auntie scooped up all the cards, squared the deck as well as she could -- Snidly's efforts had left it a little ragged in spots -- and dropped the cards in front of him. Snidly glared at the cards, and said, "Partner will deal." Auntie sighed. "OK, I suppose that means you're dealing, Isis. Just deal as though you were sitting in Snidly's seat -- you know, start with Felix, then yourself, and so forth." "And don't forget to shuffle," Dad added. So I picked up the cards and tried to shuffle them. I started with a riffle shuffle. No good! The duct-taped Ace of Mice made a big break in the middle of one stack, and I kept ending up with just two packets trying to riffle into the other cards. So I tried an overhand shuffle. No good! The edge of the duct tape stuck to the the next card, and I had cards all over the floor by the time I gave up on it. Finally I tried my personal favorite: Break the deck in two, and jam one packet, edge-on, into the other, letting the cards interleave. No good! The duct taped card wouldn't go at all to start with, and then, as I pushed harder, the tape started to peel off. I ended up with three or four cards stuck together by the loose flap of tape. "Auntie, I can't do it," I finally said. "Could we possibly find another deck of cards?" "Yes, of course, dear! I should have done that right away; I'm so sorry. Of course, we do have to be a little careful with them, since we can't replace them during the trip, but I still have almost a gross of them here in my room, so I think we can afford one more tonight..." Auntie went over to the sack in the corner of the room and brought back a new deck, which she handed to me. The black and orange box had the same design as the back of the cards on one side, with the paired Vitechat eagles, and on the other side was the image from the Ace of Cats. And there was a paper seal on the box flap. I looked at the seal as I peeled it off. "Auntie!" I exclaimed. "These are U.S. Playing Card Company cards!" "I know, dear," she said with a smile. "That's right, Herbert got them to make up a new design for us -- I think they liked it, though; it may be in their regular catalog these days." Then she added, "They're really Bee cards, with a different design, so they feel just like the ones the casinos use." "Auntie worked her way through veterinary college as a croupier," Dad added. "You worked your way through college?" I said. "I thought you were rich!" "Oh, that only happened later!" Auntie said, with a laugh. "But now, dear, if you'd be so kind as to deal, we can get on with the game." So I shuffled, thoroughly, since, like all new decks, these cards started out sorted in order. And then I dropped the pack on the table in front of Auntie and said, "Cut?" "I trust you, dear. But just to be all regular and official about it I suppose we should go through all the formalities." And she cut the cards, dropping about half of them in a pile closer to me. Dad raised one hand, and looked like he was about to say something, but then changed his mind. I picked up the pile closer to Auntie, put it on the pile next to me, and dealt, starting with Dad, as Auntie had suggested. As Snidly was struggling to get his cards onto the rack, Auntie glanced at her hand, and said to Dad, "Well, partner, what do you say?" Dad took one look at his hand, snorted, and said, "Misdeal!" He dropped his hand on the table face up, and added, "Could we please have a straight deal?" "But, Dad!" I said. "I dealt, and I shuffled! And I certainly didn't stack the cards! That's got to be just a lucky hand!" He had the top six dogs, the top five rabbits, the Ace of Mice, and the Ace of Cats. "What's wrong, Felix?" Auntie added. "That looks like a fine hand to me. You didn't like your last hand, complained it was impossibly bad, I suppose, and now you've got nice one for a change and you don't like it either!" "Right," he said. "It's a nice hand, alright. I've got all 13 tricks at notrump in my hand, no matter how the cards are played. That's not just luck. Isis, what've you got?" I looked at my hand. "Oh ... I see..." I said. "It's not just luck," I added. I had 12 mice, to the king, and the nine of rabbits. Snidly, who hadn't been listening to any of this, finally finished getting his cards onto the rack. He looked up and announced, "Twelve cats!" "Twelve cats what, dear?" asked Auntie. "I bid twelve cats. Ituafe." "As I already explained, dear, you can't bid higher than seven. And besides, dear, it's not your turn to bid yet; it's Felix's bid. And besides besides, Felix has rather rudely called a misdeal. And I didn't even deal!" she finished, in an aggrieved tone. "But I have twelve cats this time, and I want to bid them!" "I don't understand what happened!" I cried. "I couldn't do this if I wanted to -- and I shuffled and dealt!" "But Auntie cut," Dad pointed out. "How could she stack the deck just by cutting it? That doesn't make sense!" "Isis is right, Felix -- that's just not possible," Auntie said, flatly. "But ringing in a cold deck certainly is possible," Dad said, dryly. "Isis, these are not the cards you shuffled. I'm quite sure of that." "Why, Felix -- do you really think --"
Before Auntie could say any more, there was a loud crackling noise, followed by the Captain's voice. "Snidly, where are you? Snidly, to the bridge!" "Bye!" said Snidly, as he jumped off his chair and trotted out the door behind my chair. I'd never seen him respond so quickly to a summons from the Captain! And that was the end of our bridge game. Dad followed Snidly out to see what was up, and I headed back to my room for another few hours of sleep.